Fortunately, talent reigned supreme at Prom Queen . Superlative student performances combined with a near-flawless production to present a rollicking, uplifting, and emotionally satisfying show that ensured that there were few dry eyes in the house. From tears of sadness to tears of frustration to tears of joy, the crowd was deftly brought along the path from that fateful day that Marc Hall asked his boyfriend to the prom, to the moment when he successfully challenged the Durham Catholic School Board and the celebration thereafter. The story behind Prom Queen is well known around these parts. In 2002, Hall, an Oshawa high school student, found himself pitted against both the school he attended and the religion he embraced simply because of who he was. 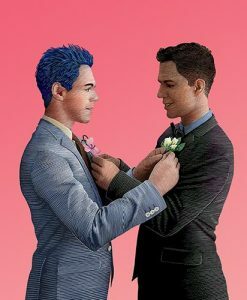 The show was brought to life by a collection of actors who weren’t even out of diapers when Hall walked into prom in a white tux and blue hair, with his boyfriend on his arm. Devon Dixon is incredible in the role of Marc, the titular prom queen. In a demanding, high-attention role, he is the foundation of the production and allows it to soar. He swings from flamboyant to melancholic with alacrity, and conveys a sense of gravity to the production without ever allowing it to devolve into preachiness. There are a number of standout performances throughout. Keith Ssemugenyi, a veteran of the High School Project who portrayed Che in last year’s Evita , is delightful to watch, bringing a cool elegance and undeniable talent and presence to his role of Boomer Bronson—the Alpha Male of the school who struggles to let his true inner self free. And Sarah Dennison has a touchingly powerful solo that left us wanting more opportunities for her to showcase her voice. But it’s Marcy Gallant who steals the show as Marc’s best friend Carly. She stood out in every scene that she was in and commanded the audience’s attention. And while these four stood out, it’s fair to say there were no weak spots in the cast. Everyone more than held their own and the combination of voices and incredible choreography propelled the action. Prom Queen is a grand production in every sense of the word: the music, the staging, and the choreography all combine to create a spectacle that rivals any of the professional productions that have recently graced the Grand’s stage. The show is a celebration of inclusion and love. And while it shows how far we’ve come in less than two decades, there are still reminders that we have much farther to go. There’s an organization collecting donations and messages of support for youth at a queer prom. The cause is wonderful and it’s a great initiative, but it also shows that there are still youth today who feel they can’t be themselves in their schools, or celebrate love in all its forms. Prom Queen gives us a wonderful way to celebrate an uplifting story of the triumph of love. But it also should serve as a reminder that we can’t rest on our laurels. Fortunately, the next generation—as shown in the High School Project—are there to lead the way.